This recipe was adapted from the New York Times, contributed by Melissa Clark. We enjoyed them with Spiced Red Lentil Soup, but they would also be wonderful for breakfast with butter and jam. In a large measuring pitcher with a spout (this makes pouring easier later), or in a bowl, whisk together milk, eggs, butter, sugar and salt until frothy. Pour batter into prepared cups. Bake 15 minutes. Turn heat down to 350 degrees and bake another 10 minutes until popovers are golden brown and puffed. (Reduce baking time by 5 minutes if using a muffin tin.) Keep tabs on their progress by looking through the window in the oven door. Do not open the oven door until the last 5 minutes of baking or they won’t puff. Just when I thought that I was running out of variations of soda bread to make for St. Patrick’s Day, I found this new one in the New York Times. 🙂 The genius idea from Melissa Clark was to bake the dough in small buns to maximize the amount of the fabulously crunchy outer crust. Yum! I weighed the dry ingredients, used raisins instead of currants, and, despite pleas from my kids, included the caraway seeds. (I love them!) Happy St. Patrick’s Day! Heat oven to 375 degrees, preferably on convection. Line a large rimmed baking sheet with parchment paper. In a large bowl, whisk together flours, sugar, baking powder, salt and baking soda. Using a pastry cutter or your fingers, work in butter until mixture forms coarse crumbs. In a small bowl or measuring cup, whisk together buttermilk and egg. Stir wet mixture into dry one until they just form a moist dough. Stir in raisins/currants and caraway seeds. Shape into a 7-inch round about 1-inch thick. Cut into 8 wedges. Using lightly floured hands, roll each wedge into a ball and transfer to the prepared baking sheet. Brush tops with a little buttermilk, and dust lightly with flour. 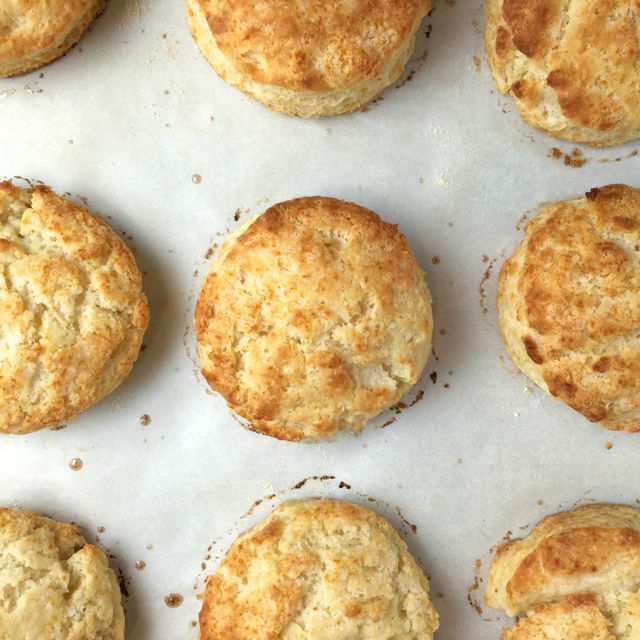 These wonderfully flaky biscuits are such a classic and simple indulgence. They make any meal just a little bit more special. 🙂 We ate them warm from the oven with Classic Split Pea Soup. This recipe is from Everyday Food. I cut the recipe in half and reduced the baking time for a convection oven. Perfect! Preheat oven to 450 degrees, preferably on convection. In a food processor, pulse flour, baking powder, baking soda, sugar, and salt to combine. Add cold butter; pulse until mixture is the texture of coarse meal, with a few pea-size pieces of butter remaining. Add buttermilk; pulse just until dough is moistened, 2 to 3 times. Transfer to a parchment paper-lined baking sheet, 1 1/2 inches apart. Brush top of rounds with melted butter. 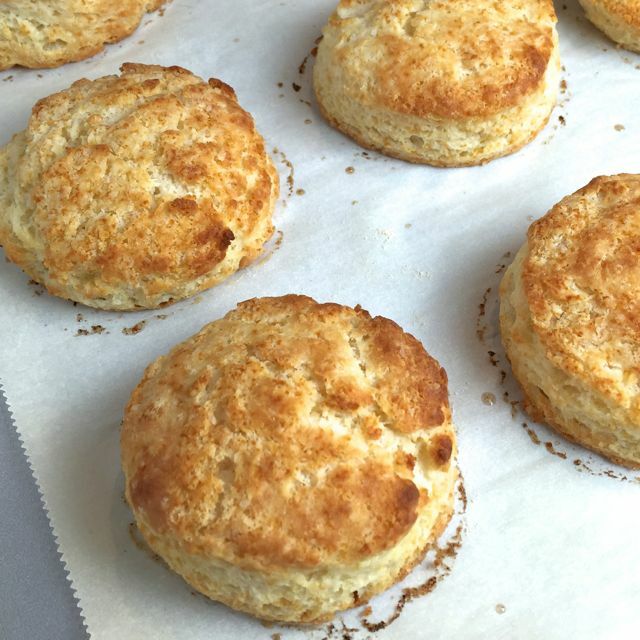 Bake until biscuits are puffed and golden, 10 minutes on convection or up to 12 to 15 minutes in a standard oven. Serve warm or at room temperature.